A round-up of all improvements and changes to the Buzz platform in version 2.0.82, available on December 22, 2016. Updated the way users can manage enrollments in the Teacher app; they can no longer enroll a user and give them more rights than they, themselves, have. 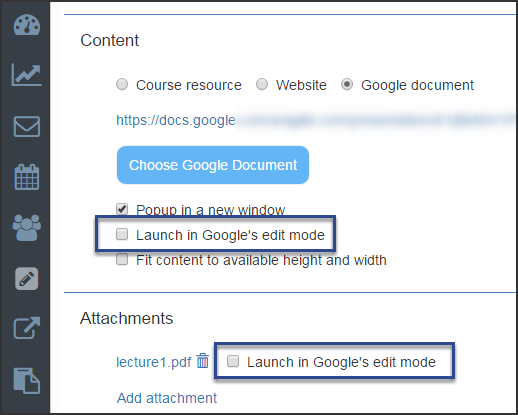 Gave course authors/teachers the option to specify how they want Google Drive activities and attachments to open for users (in Google's edit mode or preview mode). Users are only given this option if Google supports both modes for the document; preview mode is the default. This option is available only on Google Drive files added after Dec. 22. Updated the Practice Questions settings to hide all other display options when Display Question Results is set to Never. Updated the way Practice Questions are imported from BrainHoney to Buzz, so they retain selected display settings. Hid due dates in the side panel of the Editor > Scheduling screen for activities in continuous courses. Updated the Editor > Weight screen so that clicking the category weight field no longer collapses the row. Updated styles in the Editor > Weight screen to better accomodate item dragging. Hid Choice Activities from the Editor > Weight screen. Fixed an issue that sometimes duplicated unnecessary Choice Activities in the Editor. Fixed an issue that mistakenly allowed teachers to access Choice Activities from the To-Do List. Fixed an issue that would set an activity to zero when a weight of zero was applied. Fixed an issue that would display graded activities as "needs grading" when a weight of zero was applied. Fixed an issue that would cause filenames with hashtags or question marks to display incorrectly. This fix only works for files added after 12-22-2016. Fixed the way Buzz calculated weighting for categories that include extra credit. Updated the Performance tool to reflect batch updated scores automatically after the update (previously, the user had to refresh the page). Fixed an alignment issue that occurred when displaying class average score in the Activity Grader. Fixed an issue that kept the class average from automatically updating when changes were made to grades in the Activity Grader. Updated the Student app so that, when launching dropbox activities in popup windows from the Course Agenda, the Show Dropbox button now appears in the popup window. Have hidden the Visits and Total Time columns of the Score/Activity History tab for group submissions. We now show previous submission details for group assignments from the Submission History tab.